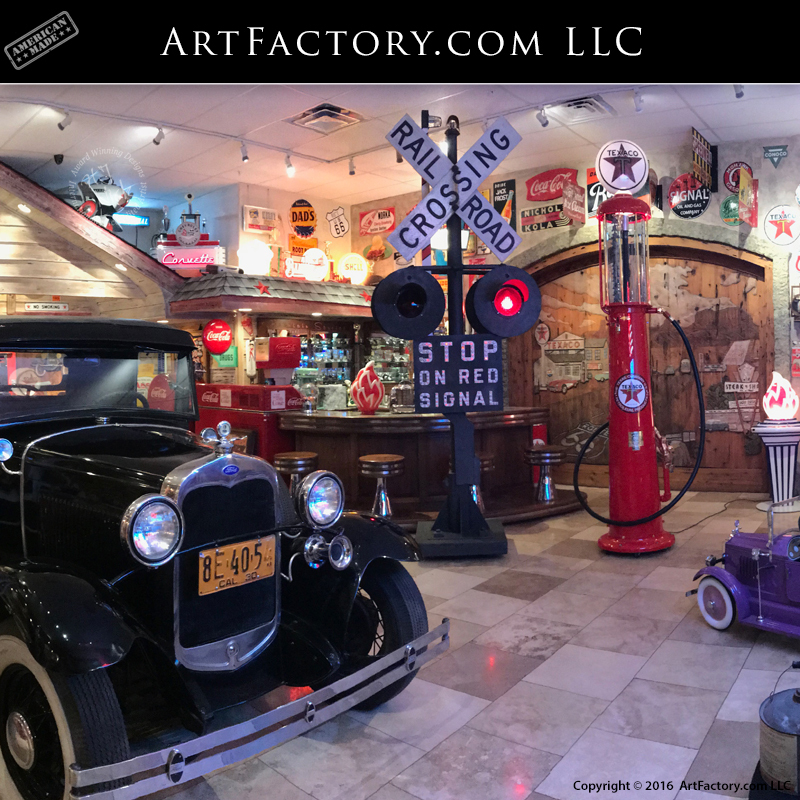 Come visit our factory gallery showroom in Scottsdale, Arizona, and visit our retro, Route 66 era, Texaco themed man cave. This fully decorated, with authentic collector Americana, showroom allows you to come out and inspect our creativity and quality first hand. Our experts at ArtFactory.com will design and fit to your specific building requirements, all while all building with historically correct signage and specifications. Displays like this one seen in our showroom are custom made to order, and pre-fabricated to be shipped all over the world. When it arrives, simply move it into place in your building, plug in, add your collectables, and enjoy. All man cave displays or prefab building sets are built to the highest building code standards and authenticity. Exterior prefabs are structural buildings built to your code requirements and delivered in easy to handle sections. (See inspiration photo this display was designed from in the Image Gallery below.) These walls can be shipped in easy to erect, do-it-yourself sections. Let our imagineer designers create your favorite retro spot or hang out from days gone by. We can make your favorite location memory a reality in every detail. In the retro collectibles man cave that you will find in our factory gallery showroom, everything is a real, collectable, appreciable asset, and everything is for sale. We do not believe in selling fakes or reproductions. We have one of the largest selections of original vintage porcelain signs available anywhere. If we say "restored," we mean a complete restoration to its original production offering, historically correct to its era. If we say "restormod", we mean an exact copy with some improved modifications or customizations. All items are collectable fine art at the highest world class collector level. We can build your display in any brand theme of your choice. Choose from any of these example photos of classic gas stations, or send in your own photo, sketch, or idea. When you choose ArtFactory.com to build your retro man cave collectibles display, your options are limited only by your imagination. Call us at 1-800-292-0008 to get started on your custom quote today. At ArtFactory.com, our retro division our motto is the same as it is with our custom fine art furnishings. That is our simple believe that "The Impossible Request Just Takes A Little Longer". As shown: This is a 1920s-1950s Texaco Gas Station designed from photos of two vintage service stations (see photos herein) - 2 x 4 construction on 16" centers. Built in sections to fit along the interior walls of the existing blank walls. The siding is 1/2" solid cedar authentic hand made lap siding the grains are raised for a weather washed aged appearance. As shown: Windows are designed to appear as exterior up sliding cross paned windows. These windows are lighted display shelves with adjustable glass shelving allowing for your small collectables to be displayed. These windows hinge open and swing out and have locking mechanisms to secure your valuable collectables. This man cave gas station includes three locking large display shelves and one open shelf unit. As shown: This station includes a lighted overhang with a hip roof and full gable design allowing for display of front sign-age as well as top shelf colletable displays. The roof is decked with genuine timberline shake shingles, The box soffit is 1/2" thick solid wood tongue and groove interlocking. Includes pre wired plug in lighting system. Entire set plugs into any 110 electrical socket. As shown: This station includes a gabled roofed front protruded drive under station entrance. Also soffit and lighted complete with doors leading in or out. This realistic station front allows for the front sign display. Our display also includes a heavy iron hand crafted Texaco oil company sign made to replicate the proper era of the station. This could also be done with a genuine old sign. As shown: This Man Cave service station includes a authentic full island for pumps. This is a hand crafted island on wheels made of solid iron construction that appears as aged concrete. This island can be pushed around at will with a full load of up to 10,000 pounds. This pump (dolly cart) island allows for the display to be rearranged, including heavy pumps in any way you wish, at will, without heavy lifting. One day its your man cave complete with your favorite collectables and the next its ready to receive your guests for a game or celebration with little effort. Be sure to check out our world class selection of museum quality, fully restored, vintage visible gas pumps.